What we have here is the follow up to yesterday's review of this album. 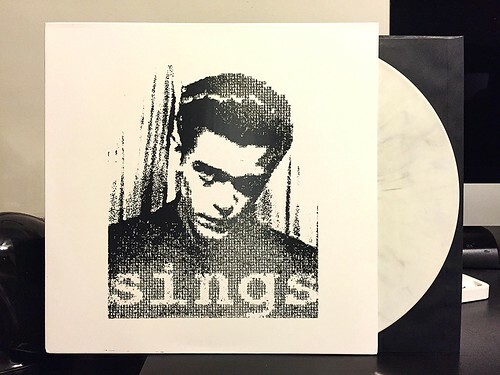 While yesterday's talked about the standard versions of the record, in both black and white vinyl, this version has a completely different cover. It's limited to 110 copies and screened black on white. You probably can't really tell from this picture, but the black that is making up the image is actually text that says "Dan Sartain" over and over again. It's a pretty neat little effect. The vinyl color is technically different as well. Even though it looks white based on my picture, it's actually white with some gray swirling. It's subtle, but it's there. Musically, this is the same exact alum as yesterday, so you can read my thoughts on the record there. In a nutshell; it's great and I like it. I think this screened cover version is sold out on the label's website, but they still have the other two variants in you need to complete (or start) your Dan Sartain collection.